Turn your fully colonized spawn bags into a Bulk harvest fast and easy using our Premium Bulk casing kit. 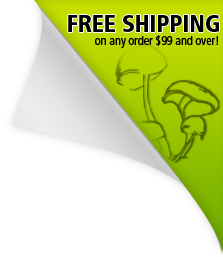 Growing mushrooms in bulk has never been easier! Once you have mastered growing in jars, this is the next step in growing! Simply break them up and mix with our perfected Select Bulk casing mix in the grow chamber provided. Typically this is an advanced growing method, but we have made growing easy by providing you with step by step instructions & everything you need to turn your grow into a blanket of shrooms! Size 20" X 15" X 12"
This kit can be used alone or easily integrated with our Ultimate or Mega Grow Kit for providing greater temperature and humidity control. This kit is designed with 1" pre-cut polyfill holes for high rate of gas exchange needed. Our specially formulated select casing mix is pre-mixed and pasteurized with the perfect water content right out of the bag. It will out-grow any basic 50/50 coir & vermiculite recipe! Save on shipping now, sealed casing bags can be stored in the fridge/freezer for up to 3 months! This kit is designed for use with two fully colonized spawn bags; 12 colonized jars can also be substituted. We use the best ingredients in our casing mix including coir, which is one of the best bulk mediums to grow mushrooms in. It's naturally resistant to mold and bacteria and mushrooms absolutely love it! There are many different brands, styles and textures of coir sold for many different uses. We use Coco Coir the best producing variety and brand available for growing mushrooms. I like this package its simple and versatile. It gives you everything you need for a bulk grow except the spawn medium witch give you leverage to choose what you want. Very happy with this purchase. I placed an order for the bulk spawn casing kit the two bags of casing that came in the kit was professionally packaged and air sealed everything came as expected and on time however the plastic tote that comes in the kit was damaged and I contacted customer support and they responded very quickly and assured me they would send me a replacement I understand the damages could of happened from delivery and not a result of thier error so I'm happy to hear they will send another I'm still currently waiting on the replacement. after researching the web,buying a top notch pressure cooker trying to do it myself. disappointment after disappointment. These guys have got this down. If you want to grow these are the guys you want!!! Absolutely love it. Amazing quality been using midwest off and on for years now and will be a return customer for many more to come!!! I would recommend ordering from Midwest. I’m slightly new with some experience with. Everything ordered was exactly as shown. I did have two totes damaged during shipping. Midwest made it right in a timely manner with no questions. I look forward to future business with Midwest.